My Little Buddy, Tyler and Me, Just Before We Left Home. Oh boy, what an evening. Unbelievable. For a kid off the cotton farms of Missouri, this was quite an evening on the town. It is a good thing that I do not partake of the wilder drinks of life, I would still be in the bed dreaming of falling off of one of those cable cars or worse yet, being smashed into by one of the trolley cars at the intersections on the hilly streets of San Francisco. This has been the trip of a lifetime for an old country boy. We visited the streets where Bullit flew up and over and around and around with the old Missouri boy at the wheel. That must have been some car. Karl Maulden and Michael Douglas used to jump on and off of the same cars we were riding. Lots of love birds around riding the cars with us, of the normal variety. We did not run into any real strange folks like I expected. I think we were shielded by our hosts. The salmon at the Fisherman's Wharf was as good as it is back home, wow. We could see Alcatraz out in the bay as the fog rolled over the famous Golden Gate Bridge. Sitting there eating our meal and just looking at all of the folks as they scurried up and down the streets looking and visiting the stores that were open until 10 pm. We walked 5 "short" blocks when we jumped the wrong cable car, trying to get back to our vehicle. My calves are killing me this am. There is no way our photos could have captured the reality of this place. Oh boy. I will try to post one later. I guess I should share with Teri the fact that she is now famous because of her husband plastering all of this stuff about her on the internet. I must find the right moment to break the news to her. Wednesday, during the "normal" part of the day, we did lots of work to the old motor coach. Replaced the final drive, Nick and Donnie did, with a lower gear so the towing of the car will be easier. Took off the old style air bag system, in the rear, and replaced with a more modern setup incorporating 4 bags in the place of the old two. Should give much better driveability, but I was looking for the safty aspect. Nick and Donnie did the work while I hung around taking pictures of them and Teri and Sam just hung out. Those two girls were very patient, being as they had been displaced from their home for the day. It was 6 feet in the air for most of the day. We absolutely crammed two days into one on Wednesday. Then, we got lost on our way in this morning. It was nearly 2 am Ca. time when we got back to the coach. Wish I could share all of our photographs with everyone. I will pick one and pot it later today. Jim and Grace Kanamota are true friends to us, and to all that know them, I am sure. The good thing is we will get to enjoy their company next week at Bert and Fay Curtis' place for the Fourth of July celebration. It is about 9 am Arizona time and we are getting ready to head over to Safford for church. Then we will eat and hit a couple stores, getting ready for our departure. I need to wash the coach and the car today. Got to have them shiny as we travel across Arizona. Hope to make it over to Parker, which is just south of Lake Havasu, on our first travel day. According to my investigation they have a casino there with free rv parking. Next night we hope to be in Bakersfield. There is a Walmart close to our route and we can park there for the evening. As it is hot, we may be the only ones parking, never can tell. I have been off the road for so long, don't know if there are any other travlers out there or not. Everyone should be in a cooler place I would think. Not sure when I will have internet again either. Cody and I worked the kid's gocart over last nite. The back axel was not running true. Seems there had been some older, bigger, riders on it than what the weight limit calls for. He cut and rewelded a couple pieces. I ran the leveler, hard part, over it to make sure we stayed as true as possible. Will get some matching paint today, spray the welds, and get it back together. I was, more or less, the job boss on the project. Our next door neighbors had their second child this week. I try to stay in touch with them, Andy and Amy, to see how big brother is handling the new arrival. The neighbor on the other side of us has his home of 50 years up for sale. I hate to see him leave. He is a good man and very friendly to us. Thanks again for stopping by. Hope to visit again soon. Well, I am a bit late today on my posting. I like to get out of the shower, read and respond to emails, and then get on here and let yall know what is going on. Today Cody, our son in law, wanted to take us out to the ranch. So, about 830 am, we headed out there. I guess its about 10 miles north on the blacktop heading to Clifton, then it is 6 miles east and north on some rough trail road. We climbed up about 1,000 feet to about 5,000. All of us loaded in the truck and were pulling a 4 wheel drive 4 wheeler in a trailer with hay and salt.There is an old farm house down in the vally. It is something else. I will load a picture later today. It is really hard to imagine that folks used to live back in there. I suspect the house was built soon after 1900 or so. Cody leases the ranch, 4500 acres and has 45 head of cattle on it. The old house is kept up and they stay in it when deer hunting and stuff. Have a generator and an lp refrigerator. It is some place. A couple of nice corrals .The photos that we took will not do justice to the place. I would say that it is about as remote an area that I have ever been to in my 53 years. It was fun but I am glad to be back in the air conditioned coach. Cody braced up our motorcycle carrier yesterday afternoon. That should about take care of that thing. A can of black paint and it will look good and should not cause any problems. It is still light enough that I can handle it by myself. That was my goal, to keep it as light weight as possible. I can no longer lift much due to a problem I am having with my right arm. Doc says it is tennis elbow. I told him I no longer play tennis so it must be a mouse elbow from the computer. Whatever it is it is painful to try to use it to lift anything. Alrighty, It is Friday, which means absolutely nothing to a retired guy, most of the time. I try to keep up with Sunday and Wednesdays and the rest really don't matter. However; today I have Teri back and that makes for a more interesting day, filled with surprises. Last three days have been rather boring with her gone. I think we are going to do some welding on the motorcycle carrier. My son in law has borrowed a welder. The carrier is way too flimsey. I got it on ebay and it was not as advertized. Have made lots of modifications to it already, before we left Dexter. Had to move the reciever, for the car, from bottom to the top so it would not drag the ground. Then, had to buy a better ramp so I could get the motorcycle up on it by myself. I just got a bad deal. Started at 100 bux. I got 300 in it now but I will have a good carrier when I get done with it. We have a rear view camera and I see that it rides just fine but could use some strengthening up a bit. I backed into a tree with it leaving my brother's house in La. That did not help it any, ha. Oh well, boring information to many of you, I know but this is my blog, I can write what I want. I have heard from several now that are reading this. Teri and I enjoy sharing things with our friends. This, and the photo site, is just a little way that we can do that. I try to carry spare parts should something break on the motor home. I got a real good deal on a distributor, with all the trimmings, this week. I had a bad cap and rotor once and had a spare. Now I have replaced those and got the distributor, basically free, to boot. Got to wrap it up and find a place to stow it away. Hope I never need it. When we were coming in here I blew an air conditioning hose on the engine. We rarely use it but I turned it on in Deming. Was in a Walmart parking lot, waiting on Teri. Have not worried about it as we normally run the roof air when we drive if air is needed. The reason the line blew is because the previous owner kept spare keys hanging on the metal line. I left them there. Well, they finally wore deep enough into the line that the pressure popped through. Had freon everywhere. Will fix it later on the trip. Well, we pull out Monday. The ole gal seems to be rearing to go. I fire up the engine every few days. She just wants to hit the road. I got the same feeling. I will miss our kids here but I am ready to move on. With us out here in the coach it is not like we are in their way. Most of the time they don't even know I am here. I don't want to wear out my welcome though. Been here three weeks now. You know the old saying about fish. I don't want to become like fish. We plan to be back this fall. Yea, the food was mighty fine at the 4h cooking school. Snuck in there right on time. Will try that again today. This is the last day for the cooking. No big plans for today, other than lunch. Teri and I went to Wednesday evening Bible Study last night, in Duncan. That was my highlight of the day. We enjoy visiting with folks after services. Teri knows all of them from when she lived out here. I have met most of them on previous trips. Sunday we will travel over to Safford for services. That is where Teri was living when we met. I spent part of yesterday getting directions to friend's places on our route. Will program them into the gps system. Bert and Fay live near Eureka, Ca. in the Redwoods. She sent very detailed instructions as they live "out". Teri and I hope to be there by July 4th. Fay says we can park our coach there while we explore the area. That will be fun. I have never been to the Redwoods of California. I am looking forward to many photographs to share with my friends. Speaking of photographs, I blew my 2 gig card and bought one on ebay. One of our kids will send it with our mail to Jerry's in Oregon so it will be a couple weeks before I get it. Maybe Teri will let me use one of her's. That card had a lot of unpublished pictures on it. Also having trouble with a tank sensor so I have one coming that I got on ebay last night. RVer's know it is not good to be without a black tank indicator. Been watching the fuel prices. They seem to be down 20 cents everywhere. I suspect they will continue to fall more. We are sitting on a tank of 3.00 gas. I do not like to put cheap gas in this coach so I filled it up right before we got here, in Lordsburg. Guess the next tank will be some of that old cheap stuff. It just seems to run better when I put 3 dollar gas in it. Oh well, maybe I can find some expensive fuel in California somewhere. Everything here is below 3 bux now. I suppose Saturday we will pend some time getting ready to roll. Been living here for three weeks so things are kinda scattered around. Got to get back in travel mode. Will drag out my "big guns" so we can snoop around for wifi signals on the road. I have a high gain, 2.4 gig beam antenna with a one watt amplifier that I will use, mounted on a camera tripod. Maybe there will be a signal somewhere around where we stay Monday and Tuesday evenings, on the road. I put my new Father's Day shirt on today, from Stasha. Arizona Diamondbacks t shirt. Told I could only wear it here in this state, ha. June 19 in Duncan, Az. Well, yesterday we received our first mail from home. We have been gone for 4 weeks. What a mess. But deep inside the box was a little note from the IRS. Seems we owe them another 750 bux. I knew I should have paid my accountant to figure my taxes, but we have had good luck the last 3 years with Tax Cut by H&R Block. Hmmm, what to do. We are into our 1st month of a 4 month trip, our tax papers are at home. Oh well, will figure something out. Teri is gone, with our daughter, teaching some 4h cooking classes at the high school so it is just Sam and me here again today. They spent the day in Safford yesterday shopping and getting home way after dark. So, I got to work on a new to me song on the guitar yesterday. Think I will practice it some more today. Ricky Nelson's Garden Party. Pretty simple. We left Missouri 4 weeks ago this coming Friday. Drove down to Monroe, La. and spent 5 nights at my youngest brother's. Helped him with some remodeling projects in his home. We left there and drove to Mineral Wells, Tx. and stayed with Walmart there. Got up and drove over to Carlsbad Caverns. Spent two nights there and then drove, on Saturday, to Duncan. We have done 400 miles, give or take a few, on each leg of our journey. Driving the GMC is a blast. It is hard from me to stop as it drives like an expensive car. Rides like an airplane on the air system. Teri and I have done lots of work on it since picking it up 3 years ago. We have installed a glass engine cover. I really enjoy it. It is made of 1/4 inch tempered glass. Approximately 2 feet square. Not only does it allow me to showcase the engine but it lets me look down and see that everything is good and dry as we travel the hiways. Pretty neat. Think I will attach a photo with this writing. Hope everyone has a great day and as always, thanks for stopping by. It is hard to remember what day it is when one does not work anymore. It is also hard to remember all of the user names we put down on stuff for the internet. I had a real time getting back in here this morning. We are in Duncan, Az. @ our daughter's. They have fixed us up with full hookups for the coach. Been here 2 weeks. Will head over to Lake Havasu next Monday on our way to San Francisco. We have a friend out in the Bay area that has a GMC motor home shop. He is going to swap out our final drive for a lower one so we can tow easier in the Rockies. We do fine on small mountains but will be nice to have a little more oomp when we head up some of these long grades out west. We are not full timers as we still own a home in Dexter, Mo. Last July I retired from the Mo. Board of Probation and Parole. I had 30 years of credited service so it was time to go. I was the supervisor of the smallest office in the state. I had 9 workers and we supervised 500 offenders, Stoddard County, Mo. I don't miss the work. I do miss my head secretary, Brenda. She took real good care of me. I doubt I could have supervised that office without her. Teri and I met in 2001 on the Oklahoma Christian College website. Both of our spouses had found others that they enjoyed more than us after 25 years of marriage. I had 2 grown children, Teri had two grown children, and now we have "adopted" a young lady and son. So it is your's mine and our's. We have 12 little grandchildren and we love each one of them equally. Anyway, Teri was living in Safford, Az. We courted over the phone and internet. I made trips here and she there until we married. Teri moved to Mo. with me and left her job with the University of Az. We have been married over 6 years and we enjoy each other very much. 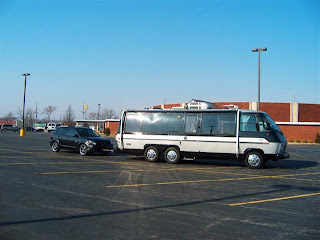 About 4 or 5 years ago, we started looking at RV's for retirement. After spending a year trying to decide what we wanted we figured if we bought a cheap motor home we could see if we liked it. If so, I would work another 5 years so we could pay cash for a new one. We decided a GMC would suit us for now. Found one near Austin, Tx. on the internet that looked to meet our expectations. I took the Friday off work before Labor Day, 2004 and we drove all night to see it. Well we bought it and drove it back to Mo. with no problems. After a few weeks, I discovered the GMCnet. Several hundred GMC owners (coach has not been built since 1978) and started asking questions and learning how to take care of this old machine. Well, Teri and I enjoyed the 26 foot machine so much, we decided to keep it, spend money on it, and I could retire now. That is what we have done. We have spent several thousand dollars on it and we have more accessories than most new ones. And, best part is, we don't owe anyone for it. Time to get going. Thanks for stopping by. Sam and our home while on the road. Teri and I travel in a 26 ft. GMC class a that has been totally rebuilt. We have an 11 1/2 year old dog that travels with us. There is a Vibe GT and a 250cc scooter also. We retired in July 06. I supervised a Parole Office for the state of Missouri. We are 52 and 49 years old. Presently we are on a 4 month trip from our home in Dexter, Missouri to Monroe, La. Carlsbad Caverns, and are presently at our daughter's in Duncan, Az. We have been here for 2 weeks and will pull out of here on June 24th heading for the northwest via California. This is our first attempt @ a blog. We shall see how it goes and will try to check in daily with information and photographs. Thanks for stopping by.